"The Quill" traveled to Florida and then to Mississippi with June and Kay Galbraith recently. 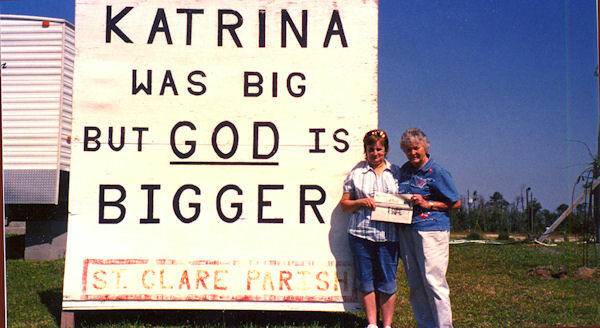 In Mississippi, June's sister-in-law took them to Waveland to observe the damage left by Katrina. After almost 3 years, the devastation was still quite evident. "The Quill" is pictured at the site of a Catholic Church facing the Gulf of Mexico. Nothing was left but this sign and the FEMA trailer they now use for their worship services. When you go on a trip, take "The Quill" along and capture your picture with it, and submit it to us. Let's see where all "The Quill" can travel.